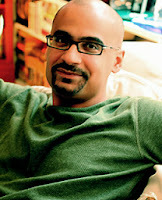 Junot Diaz: What is youth good for? Donna Tartt seems to publish a new novel about every eleven years or so. I was just about to dive into the first (that I know about) The Secret History, when I kept reading about her latest The Goldfinch. I was hooked by the reviews. The main character Theo is about eleven when the actual story begins, living with his divorced mom in their New York apartment, setting out for a parent conference after his suspension from school. On the way, though, nauseous from the cab ride, they hop out ahead of their destination and because of the rain and time they have to kill before the appointment, they go into a museum with a visiting exhibit of European artworks from around the time of Rembrandt and Vermeer. The Anatomy Lesson is there, along with a small painting by Fabritius, The Goldfinch, a small painting of a bird, its leg held by a barely visible wire. Along with a number of school groups, Theo also notices with interest a red-haired girl there with an elderly man he assumes is her grandfather. While the two make eye contact, they never speak, yet he is intrigued by her. As they get ready to leave, standing near the gift shop, his mother decides to go back for one more look at The Anatomy Lesson, but Theo decides to wait for her, hoping for a closer brush with the girl. Instead, someone rushes in, there's a huge explosion, and he comes to later to find himself in the middle of the destruction of a bombing, presumably an act of terrorism. The old man, seriously injured near him, gives him a ring and a package. Unable to find his mother, Theo picks his way out of the museum to the chaos outside and finally decides to follow their established emergency plan if separated: he goes home. The story from that point takes him to the antique shop where the old man had been co-owner, to Las Vegas for awhile to live with his alcoholic, gambling father and his girlfriend Xandra, where he meets Boris, a Russian immigrant in his class who becomes his closest adolescent companion until he leaves and returns to New York. 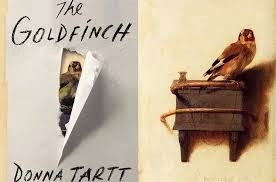 Tartt weaves a long, beautifully told, even painful story as Theo reaches adulthood, taking the old man's place as a partner in the antique shop, but also dabbling with art fraud and caught up in illegal drug use. As important to him as his friend Boris, his partner Hobie and the mysterious red-haired Pippa, are the wealthy family of a classmate that took him in for awhile after the loss of his mother. His life bears the indelible but inescapable mark of the tragedy at the museum, which he sees reflected in Pippa, also a scarred survivor. As a lover of museums, I find myself drawn to fiction--even nonfiction--about art and artists. Reading this novel, I just assumed the work--like The Girl in Hyacinth Blue--was a fictional work of art, so my discovery after finishing the book that it exists, that my friend Carol, another voracious reader, had actually seen the painting at the Frick, means that now I have more research to do, another artist, another painting about which I must know more. Maybe I'll figure out a way to visit the Frick Museum before the painting heads back to its usual place. Through this most hectic of holiday periods, I have found myself woefully behind in book posts, for which I apologize. I have, though, found time to read, even when everything else in my life has been frenzied and hectic. One drawback of a teaching career is that I hit that grading/posting deadline twice a year, not just once. (Think of April 15 for CPAs or December 25 for Santa and the elf crew). The first year I taught was particularly stressful, and I had the foolish misfortune of having research papers due right around the end of the first semester. That year, as many of my students may remember, we still didn't have a tree the Saturday before Christmas and might not have had one at all had not three of the boys from the senior class delivered on they said they had cut themselves to my driveway. It was beautiful-- at least twelve feet tall, perfect for the out high ceiling in the living room. Recently, in a Facebook conversation with the goodhearted tree givers, most of them pled the fifth or asked if the statute of limitations was up. Enough said. This year, though, I've read a wonderful variety of books the last three or four weeks, so I can't wait to share some of them. I will also be taking down my wall calendar for 2013 so I can transcribe a list of everything I read in the past year. 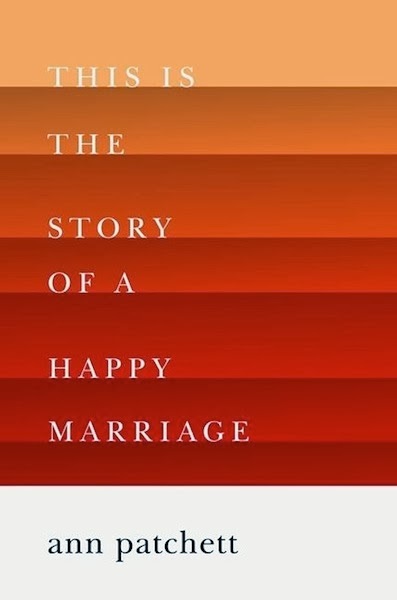 For now, though, I want to mention one I'm not quite through reading, Ann Patchett's recent collection of essays and other nonfiction pieces, This Is the Story of a Happy Marriage. I've been a Patchett fan for years, ever since I read Bel Canto. That book captivated me for many reasons. It's one of those books that has stuck with me in ways some books don't. I remember tiny incidences, specific characters, impressions from the book. I've had the chance to hear her speak three times--once with Allan Gurganus, one of her professors and a gentleman I have grown to admire for his writing and for his generosity of spirit, one at the NCTE convention in Nashville several years ago (in which she reinforced her support of assigning the classics to high school students), and recently at UNC-Asheville. Reading through this recent collection, I sometimes feel guilty for presuming to think I know an author simply because I've read her books, for even daring to think I could breach her wall of privacy. She comes across as both private and approachable, a confusing mix. Since I always visit Parnassus Books, the store she co-owns, when I'm in Nashville, and because she lives in a city I've loved since my own college years, I am always overwhelmed by the sense of the familiar when I read her essays. I also feel a particular connection when she touches on topics of interest to me. Case in point: She has one essay explaining the controversy that arose when Clemson selected her memoir Truth and Beauty as their freshman read, after which an alum decided the book was vile, as must be its author. She also publishes the speech she wrote and delivered at Clemson (accompanied by a bodyguard provided by the college.) My overwhelming takeaway is the need for students--especially college students--to see their educations as something in which they engage, not as something done to them. When I make reading assignments in my classes, I try to do so with conscientious purpose. I would never choose something prurient for the sake of shock; however, I sometimes find a book or a story worth reading together, even when I find some ideas or language or situations objectionable. Teaching English and literature, I've always believed, is about teaching people to think. I don't know if it's possible to teach anyone HOW to think, but I certainly try to encourage the process of critical thinking. Already, I'm considering ways to interject some of these pieces in my upcoming composition course, where I hope to engage my students in thinking, talking, and writing about their own learning, their educational goals, the development of their own system of values, perhaps shaped by their families, but adopted intentionally. I don't think they'll find any of that in Spark Notes. 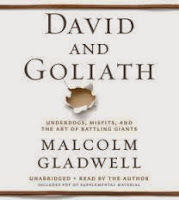 While I've read articles and heard plenty of references to Malcolm Gladwell's writing, I hadn't sat down and read anything of his in its entirety. This book, though, caught my attention. Several book reviews lured me in, and then when I visited Malaprop's bookstore in Asheville, I was invited to log on and help the store win a visit from the author. As I have said often before (and contradicted by my actual reading), I tend to prefer fiction to nonfiction. Maybe what grabbed me with this book then, besides the subject matter, was Gladwell's use of narrative. He begins, naturally, with the David and Goliath story from the Old Testament, pointing out discrepancies between the actual story recorded there and the selective details we tend to remember or misremember. From that point on, Gladwell points to the many ways in which one's disabilities, misfortunes, and weaknesses can actually become strengths and our apparent strengths can hold us back. He used examples from history--the leaders of the Civil Rights movement, conflicts in Northern Ireland, the Impressionists painters and their exclusion from the Salon. He told the stories of ordinary people--or those who became extraordinary despite what others might have perceived as weakness. I was particularly fascinated by his evidence of the number of extremely successful people with dyslexia and the creativity and life success of people who had lost parents during their childhood. One of the points that kept surfacing was the way individuals can choose to respond. The story he told of a Mennonite family whose daughter was murdered, but who chose not to react the same way as the father of another murdered child who came to their door. They chose to forgive and move forward. He also presented what economists might call "the point of diminishing returns"--the U-shaped curve. He used the principle to discredit the effectiveness of California's "Three Strikes" legislation and the unquestioning push for smaller classrooms. I liked the way the book made me think; I especially appreciated the way it keeps echoing in my day-to-day life, its principles coming to life. I may have to do some remedial reading and check out Gladwell's earlier books now. It's been awhile since I read Robert Hicks' first novel (as far as I know), Widow of the South, a story set in and around the Battle of Franklin (Tennessee) when the McGavock's home became a makeshift hospital and the lady of the house took it upon herself to bury and account for all the dead, rather than to let them be left anonymously where they fell. 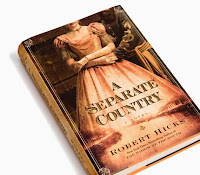 Hicks' next novel, A Separate Country, also historical fiction, takes place after the war, but in New Orleans, rather than Middle Tennessee. While he tells his story from a number of perspectives, they are all connected to the Confederate General John Bell Hood. According to this story, near death from the "yellow jack" that also took his wife and oldest daughter Lydia just days earlier, he calls Eli Griffin, a young man he met during the war, and asks him to help him set his story straight. According to the narrative, he's given the draft of his war novel Advance and Retreat (which he did actually write) to Gen. P. T. Beauregard, but now has second thoughts and wants the book destroyed. In its place, he has written an account of his life since. At the time, Griffin finds the journals of Hood's late wife Anna Marie, letters written to their daughter Lydia. Between the two stories, Griffin is able to put together what has really passed. The marriage of Anna Marie Hennen, the socialite daughter of a prosperous New Orleans family, to Hood, bearded, with a useless arm and a missing leg, souvenirs of his war experience. He fails in every business he attempts, in part because of lack of business acumen, in part because of the yellow fever epidemic that keeps merchandise from reaching the city. Instead, he loses himself in a movement--perhaps just a drop in the bucket--to help the city's black residents to escape the miasma of the city. Hicks' characters include three childhood friends of Annamarie, two orphans--a dwarf and a young white-skinned man with just enough blood to be considered black in the post-Civil War South--and a former street tough Michel, who has become the priest Father Mike. Hood has also been haunted by Sebastian LeMerl, a New Orleans native of French descent who served under Hood and killed ruthlessly during the war. His one gift, killing, has not deserted him in the years since. It is he, however, to whom Hood wants his book delivered to see if he has cleared himself of his demons. The novel not only paints curious, interesting characters, but a portrait of New Orleans--the sounds, the smells, the action. I could not wait to look into the life of Hood, finding that the historical details are true and his reputation as a military leader who took unnecessary risks remains intact. I couldn't help wondering how many other famous men and women, having published memoirs with much of their lives remaining, would wish to have rewritten or amended their stories. Note that misspelling of proper names (which I will edit when I look closely at my print copy of the book) are a direct result of my audiobook experience. Living in this part of the state, I am presented with so many amazing opportunities to hear great music and brilliant writers. This week, Junot Diaz, the Domincan-American author and Pulitzer Prize winner, spoke at Lenoir-Rhyne University as part of their top-notch Visiting Writers Series, just celebrating its twenty-fifth year. As much as I enjoyed his reading a selection from his Brief Wondrous Life of Oscar Wao, I was even more moved by his earlier comments, based on his experience as a teacher. He asked the question: What is youth good for? What can be done when you’re young? He suggested the answer: Adventure. He also pointed out that no parents told their children, “Move out! Major in whatever the hell you want.” In fact, he says the 17 to 19-year-olds he encounters have been socialized to think like 68-year-olds. Their baseline is fundamentally FEAR. He said even at MIT, where he teaches students considered the best and the brightest, those who should be most confident, they exist in waves of fear: (Need to think every day about how to get a career, to make money.) Adults, he said, know that there’s no controlling your world. Young people should have horizons, not fear. He says the only way to become an artist is to begin at that place without fear—a hopeful place. The artist, he says, imagines despite culture that what he or she is doing is irrelevant (“You’ll go broke. Nobody cares what you do.”) Artists, he said, must have a “tremendous, almost evangelical hope.” By contrast, people are geared toward “instrumental” vocations. He said he wishes schools would put more art near students. When we read the books we love most, he said, art grants us back to our better selves. We create a safe harbor for our souls. To trust what’s most important to anybody else, he says, is a bad idea. He went on to say that the point of college is to be utterly transformed. The fearful know nothing about compassion. He says that his students so rarely have compassion for themselves. They need to know, despite being told otherwise, that it is okay to fail. “The voyage of discovery is not possible without failing,” he said. “The only way you discover anything new is by first being lost.” There can be no life or learning without failure. By the time he read from his work, the audience was his. As he read a passage from the point of view of a young girl whose mother finds a lump in her breast, we were ready to suspend our disbelief and enter that world. As I left, though, I couldn’t stop thinking about how to help my own students overcome their fear. Maybe I’ll start by surrounding them with more art—visual, literary, and musical. Most Southern family stories are set in small rural towns in the distant, if not the faraway, past. 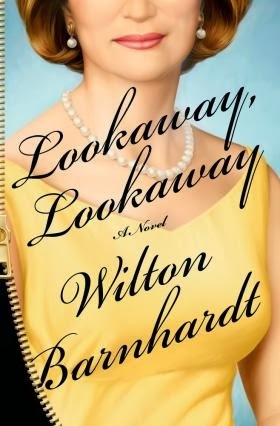 Wilton Barnhardt's newest novel Lookaway, Lookaway is plopped down right in the middle of Charlotte, North Carolina, over the last decade, and the family Johnston and Jarvis families at the center of the story are far removed from tales of sharecroppers and hardscrabble living. Instead, he shifts back and forth among the members of a family at the center of Charlotte society but at the end of their fortune. The book opens as the younger daughter Jerilyn heads to UNC in Chapel Hill, determined against her mother's wishes to pledge a sorority--and not even her mother's staid sorority but the edgy Sigma Kappa Nu, referred to as Skanks, even by the members themselves. If the first chapter or two reads like an episode out of the movie American Pie or Animal House, readers can expect it to zig and zag quickly. Jerilyn's parents, Duke and Jerene Jarvis Johnston are living in a home in moneyed Charlotte, where he has a Civil War room holding his collection of guns and collectibles from the period. He actively organizes and participates in a reenactment of a minor Skirmish just over the state line in South Carolina, and financial pressures move him to collaborate with developers who convince him they plan to preserve the field as a historical landmarks, keeping houses tastefully distant. The agreement is closed with a gentleman's handshake, but these men are not gentlemen. Barnhardt introduces every possible current controversy, particularly those hotbed topics in the South, with each new character. While Jerene manages the family's trust at the Mint Museum of art, her brother Gaston Jarvis churns out a series of highly successful but hardly literary Civil War novels, failing to live up to his early promise, and never actually writing the novel he and his brother-in-law and college friend Bo Johnston dreamed up in Durham, Lookaway, Dixieland. He spends his days in the bar at the country club to which he gained membership because of his Johnston family connections. The Johnston's gay son Josh works in a men's clothing and searches the internet for potential African American liaisons, usually under the watchful eye of his closest friend Dorrie, a black lesbian woman with an attraction to white society women. Meanwhile, his brother Bo pastors a prestigious Presbyterian church, aided by his wife Katie, who's just a bit too rough around the edges for her mother-in-law's tastes. Rounding off the Johnston's siblings is the older daughter Annie, working through her third unsuccessful marriage as she builds a high profile real estate business in Charlotte. The plot winds through the banking turmoil festering in Charlotte, the mortgage and housing decline, all with a balance between dark humor and tongue-in-cheek wit. Barnhardt and his cast of characters manage to address race, gender, society, religious, financial scandal, literary rise and fall, university life, and politics. At the heart, though, it is a family story. With the huge ensemble cast, readers may find themselves reaching the final pages before deciding this is Jerene Jarvis Johnston's story most of all, particularly since she gets the literary last word. I have a number of book review to post, but I thought I might take a moment to add a few miscellaneous book notes. First, while I was in Southern Pines last weekend on a retreat with my writing group, we went to the sixtieth anniversary celebration of The Country Bookshop downtown. Entering an independent bookstore poses dangers for me. I see so many books I already know I want to read, and then I discover new ones. I did walk away with a signed copy of Allan Gurganus' new novel Local Souls. I enjoy his work and I love to hear him speak too. At the checkout, though, the gentleman working recommended another book, and I was sold. I also had the honor or presenting a program for the "No Name Book Club" in Hickory Tuesday. The members of the group each get to choose one book for the club to read, and Helen selected by poetry chapbook Let the Lady Speak. I was especially pleased to get to talk poetry with readers who generally choose fiction--or at least prose.--because I have a pending poetry project with book clubbers in mind. I have always been amused to hear which poems of mine appeal to different readers. Since I could at least assume most of them had read the chapbook, I hated just to read the poems to them, so I first shared a couple of other poems by poets I admire that I thought would also appeal to them. I also talked about hos many of my poems were "born." They asked me to read some particular poems they'd enjoyed. I also loved to hear what others are reading, so naturally, I left with a few additions to my "to read" list. I'll be signing on again in a day or so to share my review of Lookaway, Lookaway by Wilton Barnhardt--and maybe a few other recent reads. Stay tuned. I know the prevailing rule of thumb is that when you start a book, you must read one hundred pages minus your ages before giving up on it. I haven't figured out how to apply that principle to audiobooks. I always feel a certain constraint because the selection is more limited. I could read print books without never buying another (although the likelihood of that happening is slim to none) but I have worked my way through the collections of three local libraries. I find it harder and harder to find something to listening to on my 50-60 minute daily commute. 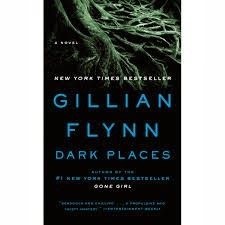 I had read Gillian Flynn's bestseller Gone Girl, which ended up dark enough, so when I started her prior novel Dark Places, I almost stopped listening at the first CD, not because the book wasn't engaging but the story was so dark and the protagonist was so damaged by events in her childhood, I wasn't sure I could stick with it. I did. In this story, Libby Day, the protagonist has survived the murder of her mother and two sisters, a crime for which her brother Ben has been in prison for twenty-four years. Libby testified against him at sever years old, but as the novel opens, she has basically existed on the money donated to her by well-meaning people after the tragedy. The money, she learns, is running out, and she has no job and no prospects of income. Then she gets a call from a young man who is a member of the "Kill Club," a large organization of people obsessed with unsolved murders. He offers her money to come to the convention and appear at the Day Group's booth. While the experience is maddening, she realizes she can profit from the group's desire to solve the mystery. (Ironically, until they suggest her brother's innocence, she's never considered he might not have killed the rest of their family.) What follows is essential the solving of a mystery. Flynn alternates between chapters focusing on Libby, her mother, and her brother Ben. The narrative alternates between the day or two before the murder and the present day. Ben, a fifteen year old at the time of the murders was a high school misfit, who ends up with a senior girlfriend, new in town, with parents more absent than present. Ben gets involved with her and her cousin (at least that's their story) in drugs, drinking, and eventually satanic rituals. While Libby remains a sympathetic character throughout the novel, she doesn't inspire warmth. She seems so damaged by her experiences that she pushes everyone away. If the other characters had an ounce of redeeming value, she might suffer more by comparison, but Ben's girlfriend Deandra comes across as so mean and manipulative that Libby can only shine by contrast. My overall feeling as I finished the novel was that some messes can't ever be completely made right. While Flynn doesn't try to tie a neat bow around the ending, she does leave the reader hopeful. She also left me eager to read something hysterically funny to offset the dark places she took me. I should be suspicious of retellings, but I'm not. I loved Jane Eyre, and I love Rhys' The Wide Sargasso Sea. I thought Smiley's One Thousand Acres was a marvelous treatment of King Lear, and The Story of Edgar Sawtelle, a beautfiul story on its own, was such a magical Hamlet story. 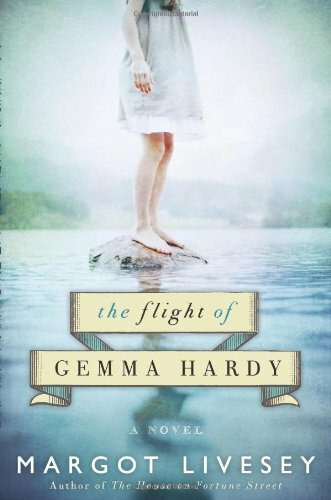 When I finally began Margot Livesey's The Flight of Gemma Hardy, I picked it in part because I knew it was also a Jane Eyre story, set this time in Scotland in the late 1960s. Gemma was born to a Scottish mother and Finnish father, but was brought back to Scotland by her uncle when her parents died. The beloved uncle's death (of course) leaves her at the mercy of a merciless aunt and hateful cousins. She ends up as a "working girl"--one of the youngest--at a boarding school, where she eventually makes a friend--who dies (of course). What makes this novel worth reading is not so much the familiar threads borrowed from Bronte, but the ways Livesey takes the story her own way. There are enough similarities in the plot that I'm wanting to scream, "No, Gemma! Watch your bags!" But some of the more Gothic details have been eliminated. Through naivete and bad luck, Gemma finds herself in a variety of situations--as an au pair to an orphaned daughter of a single mother in the Orkneys (with the dark and mysterious uncle--of course); sleeping in an unlocked church, rescued and nursed back to health by a potter and her partner and brother, and as a sitter and tutor to another motherless boy. Part of her quest takes her to Finnland, the home she hardly remembers, searching for any remaining kin. Perhaps one of the only flaws in the plot is a little deus ex machina that brings the final threads together. Livesey has the grace, though, to stop short of having Gemma deliver a final pronouncement to her "dear reader." 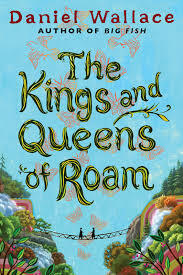 Anyone familiar with Daniel Wallace's Big Fish, his novel that went on to become a delightful major motion picture would recognize his quirky sense of humor, even magic in his newest novel The Kings and Queens of Roam. The book almost defies description, but I'll try because it's one of the few books I've read, thinking the whole time, As soon as I finish this book, I'm going to have to read it again. Roam, the town in which the story is set, is slowly dying. In fact, many of the empty houses abandoned by those leaving as the town's silk industry dries up, are inhabited by the town's ghosts, who spend time waiting for housing by hanging out at the local bar, seen only by Digby, who runs the joint. The story centers around two sisters, Helen and Rachel McCallister, descendents of the town's founded, who came, along with a Chinaman he's basically kidnapped for his knowledge of silk-making. The decision to settle was based solely on the presence of the necessary mulberry trees. The unattractive Helen lives alone with her blind sister Rachel in their family home after their parents' tragic death, their car running off the bridge on their way to get water they hope will heal their daughter's eyes. Because Rachel has no idea she is a beautiful as Helen is ugly, Helen decides to "swap faces with her.," convincing her innocent--and dependent--younger sister that people can't bare to look at her. The odd cast of characters include the descendents of the elderly Elijah McCallister and his "friend and hostage" Ming Kai, whom McCallister had promised to reunite with his Chinese family, bringing instead a substitute wife and children. Wallace also introduces one of several lumberjacks who return to Roam in the off season, one with a dog he loves but leaves chained up at home. All the lives eventually intersect when Rachel runs away, thinking she is relieving her sister of the burden of caring for her. Rachel is rescued by a man who is just as dishonest to her as her sister was, in order to keep her dependent on him. Simple plot summary of this story, though, completely misses the charm of Wallace's magic. I found myself lingering over passages, moving on only by promising I'd go back and read again to try to decide just what about the book and its telling captivated me so much. 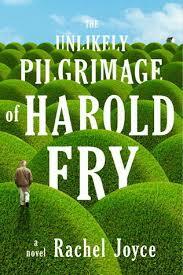 The story and the setting were heavy in fantasy, but the human nature was spot on. Most people who know me know that tend to read more fiction than nonfiction. I love story. I also feel strongly that a work of fiction can also be true. Truth does not equal fact. I'll climb down off my soap box now. Usually when I read Jodi Picoult, it's a selection by someone in my book group. I recognize that she tackles a lot of controversial or current topics.She also tends to throw readers a curve ball at the end of most of her novels. (Excuse the mixed metaphor there.) This book, though, particularly caught my attention since I am starting this week to team teach the Holocaust class offered at the college where I work. This is either the third or fourth time I've been involved with the course. As we plan the syllabus, inevitably the challenge is what to leave out, since there are so many books, poems, movies and more. In this novel, she weaves a story with three interlocking lines--at least three. The main character Sage (with sisters named Saffron and Pepper. Seriously.) is a young single woman working the graveyard shift as a baker in order to avoid people. She has a facial scar, the result of a car accident that led to her mother's death. Obviously, some of her scars are invisible. At her grief group she forms a friendship with an elderly man, whom she learns was a Nazi officer during WWII. The second story line is that of her grandmother Minka, the daughter of a baker and a survivor of Auschwitz. She also has created a Gothic fairytale, putting her in the role of Sheherazade in the camps. 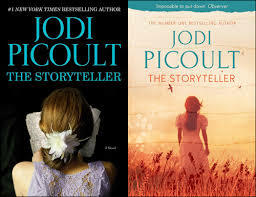 Into the mix Picoult adds the married man with whom Sage has conducted a relationship after he served as undertaker for her mother's funeral. The unlikely hero of the story is a young agent working to locate former Nazis and bring them to justice. At times readers may find Sage a character unlikely to elicit sympathy. I can't say that I always liked her--or believed her. I did want things to work out for her. Some of the secondary characters were caricatures--one of Sage's co-workers who speaks only in haiku. (Technically, since he only adhere's to syllable count, his lines would be senryu). Her boss is a former nun. The other members of the grief group also seem a little over the top sometime. The best part of the story, I believe, is Minka's story. Picoult has evidently researched her topic carefully. The young German officer, while evil, seems believable in light of historical accounts. Picoult has a natural audience for her fiction, and in this case, she deals with a period of history that can't be ignored. She certainly led me to investigate further a story in which I am now about to be immersed for another semester. Awhile back, I needed to come up with a name for a word document that would not draw attention to itself. What I chose (and I could tell you, but I'd have to kill you) isn't too far from the title of the second book I've read this summer by Jess Walter, The Financial Lives of Poets. As an English instructor with an undergraduate degree in accounting, I couldn't possibly pass up this particular novel, now could I? 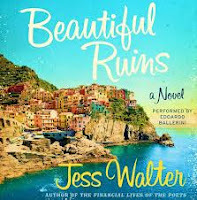 I must say, first, that nothing about the plot or the characters of this novel remind me of Walters' most recent success, Beautiful Ruins (which I do believe I've discussed in an earlier post). But the writing is certainly as engaging. In this case, his protagonist Matthew Prior goes to a 7/11 for milk (at, he claims, nine dollars a gallon) when he runs into young men who turn out to be drug dealers. They pressure him into giving him a ride to their place (all the while, drinking right out of his jug of milk). One thing he learns on his late night adventure is that marijuana has certainly changed from his college days. Prior's foray out of the house at this unlikely hour, readers learn, is motivated in part by the looming disaster in his personal life. He's quit a journalism job and invests in a website offering financial advice incorporating poetry--presumably to make it more interesting. Needless to say, the venture hasn't realized the success he'd hoped. Meanwhile, he's on the brink of losing his house--and his wife, whom he has discovered is carrying on a texting relationship at least with a former boyfriend. The lengths he goes to try to remain solvent and to gain an advantage over his wife's old flame are quirky and hilarious. Readers are often one step ahead of Matt as his shenanigans always take the worst possible turns. To compound his misery, his father--suffering from dementia--is living with him and carrying on the same three or four conversations over and over. Walters manages to turn what sounds like a dark and dreadful story into a genuinely funny adventure. Interesting enough, I just learned, to lure Jack Black into a movie called Bailout, based on the novel, still listed in IMDB as "in development." I'm looking forward to seeing what develops. This summer was so packed full that when I had to choose between reading and writing about what I read, I guess I chose reading. The little blog fiasco slowed me down a little too. As a result, I have plenty to share now that I'm back in school. 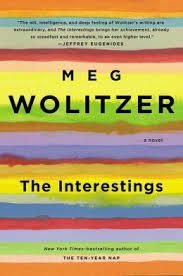 I've had Meg Wolitzer books sitting on my shelf awhile, but something about the latest, The Interestings, caught my attention. And while you shouldn't judge a book by its cover, this one is particularly attractive. The scenario isn't necessarily original--the lives of a disparate group of teenagers who become unlikely friends and stay close into adulthood. In this case, the group meets in the early seventies at a camp for artsy kids. While this is something of an ensemble cast, Julie Jacobson (who become Jules her first summer) emerges as the protagonist. She ends up at the camp right after her father dies in his forties from pancreatic cancer. A teacher manages to help her go on scholarship, and while there, she is included in a small circle of teens she would normally consider out of her league. The most charismatic of the group, Ash Fox, who attends the camp with her underachieving brother Goodman, becomes Jules best friend. Also in the circle are Ethan Figman, already a prodigy at fifteen, an unattractive but personal boy with a talent for drawing a cartoon he calls Figland. While he is drawn to Jules, she keeps their relationship in the friend zone. Also in the group are Jonah Bay, the son of a famous folk singer, talented himself, but carrying a burdensome secret placed on him by one of his mother's former singing partners. Rounding out the group is Kathy Kiplinger, a talented dancer already growing into too womanly a body for a future career. Woltizer follows the teens as they maintain their friendship between camp summers, usually meeting at the Fox's New York City home, the Labyrinth. An incident between Goodman and Kathy ends up changing their lives and the nature of their relationships. Wolitzer sheds light on what happens to people living in the shadow of those they perceive as having it all. Jules and her husband--not one of the circle of Interestings--live ordinary lives, sometimes touched by depression, and often by envy, particularly of Ethan and Ash. Ironically, these two, while financially successful, have to deal with a special needs child and with several family crises.Wolitzer also deals with the effect of secrets kept from marriage partners. While she touches on lots of current events and social issues, Wolitzer primarily focuses on human relationships, love, and trust. This has been one of the most frustrating, tedious web adventures for me so far, but as of 1:29 a.m. on Wednesday (Is it Wednesday? ), I finally have my domain name back--and working. Many thanks to the patient gentleman who just finished troubleshooting. I have plenty of catching up to do now, but this week I am at the Swannanoa Gathering Old Time Music and Dance Week at Warren Wilson College, so I won't be getting much reading done. However, since I've finished eleven books in July so far, I have lots to share soon: Jess Walter's The Financial Lives of Poets (very funny and nothing like his novel Beautiful Ruins); Jeanette Walls' The Silver Star, her first novel after her two nonfiction works, The Glass Castle and Half-Broke Horses; Peter Heller's The Dog Star (for anyone in the mood for a dark little mid-apocalyptic novel); Becoming Odyssa, Jennifer Pharr Davis' memoir of her adventures on the Appalachian Trail; The Fault in Our Stars, John Green's wonderful YA novel--and there are plenty more. I'll keep you posted. ...and not a minute too soon: And the Mountains Echoed. I just finished Khaled Hosseini's third novel And the Mountains Echoed. So far, he's three for three, as far as I'm concerned. The Kite Runner probably received more publicity (and the movie deal), but I thought the next one A Thousand Splendid Suns was at least as good, maybe better. This time, I opted for audio for two reasons: (1. 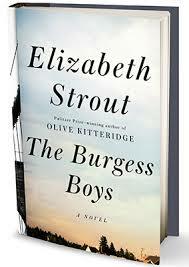 It was available at the library; (2. the author's reading the parts with a male narrator. Let me make that three: (3. I heard from another reading friend who'd just finished listening and loved it. I did too. This novel, set mainly but not exclusively in Afghanistan, covers several decades and several main characters, whose lives overlap, sometimes directly, sometimes tangentially. Overall, though, it is a family story, looking closely at several parent-child and sibling relationships. If I were to ask whose story this is, I'd be at a loss, since the focus shifts. It begins and ends with the relationship between Abdullah and his sister Pari. Along the way, I kept hearing this little crack, which I recognized as my heart breaking--over and over.. Even the folktale the father tells in the beginning had that effect. In some cases I saw people faced with impossible choices for which there was no good solution. Other characters, though, managed not to do the right thing, sometimes through selfishness and others through procrastination. One of the most gut-wrenching parts for me was the story of a young Afghan man who returns to the country of his childhood after living successfully in California. He forms a strong bond with a young girl he meets in a hospital and leaves with the best of intentions to help her. But he doesn't. I read an article recently in the Charlotte Observer about some of the great fiction that has come out of North Carolina (and I agree). The final point, though, was the value of reading fiction--it's power to build empathy in readers. Every time I read Hosseini, I feel myself a part of a world that becomes increasingly smaller. "I've always depended on the kindness of strangers." --Blanche DuBois, A Streetcar Named Desire. I am still looking for records because I feel certain I renewed my blog domain in May, but as of two days ago, when I go directly to discriminatingreader.com, I find nothing. My dependable techie expert at least helped me find who owns it now, and I tracked her down in her car somewhere between Texas (where she lives) and somewhere else. She seemed nice enough (for someone who has a program that automatically buys up lapsed domain names) and promises to get back to me when she gets home to resolve this issue. Maybe I'll just start keeping a diary and sending more handwritten letters again. We will see. I will keep you posted. No pun intended. There's an up side and a down side to reading a book about books. On one hand, it's about reading; on the other, by the end, my "need to read" list had grown again. 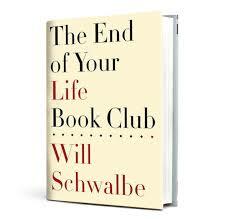 I first heard of Will Schwalbe's memoir in an article he wrote for the New York Times, I believe, describing the "book club for two" he shared with his mother while waiting with her for her treatments after she was diagnosed with pancreatic cancer. Schwalbe was an avid reader from childhood, growing up in a family of readers. The time he spent with his mother, especially once she faced chemotherapy, naturally lead to talk about what they were reading. They decided to choose books to read and discuss together over the course of what was more than a year of her illness. They alternated between recent publications and classics, mostly but not entirely fiction. Often each would choose a title, and they would swap the two before discussing them. Among the titles they shared were Elizabeth Strout's Olive Kitteridge, Alan Bennett's The Uncommon Reader, Eliot's Murder in the Cathedral, Lahiri's short story collection Unaccustomed Earth, Geraldine Brooks' People of the Book, Randy Pausch's The Last Lecture, and Sheila Weller's Girls Like Us, all books I'd read and enjoyed, many with my book club. They also read Maugham, John O'Hara, Joan Didion, Alice Munro and many more. The book provides much good for thought, not only about reading and death but life, love, family, and faith. As I read, I not only marked passages to which I hoped to return, but I started my own list in the back of works mentioned that I wanted to read myself. Once I reached the end, I found that the author had thoughtfully included a list of works discussed, which I would have found if, like Schwalbe's mother, I had always chosen to read the end first. I'm usually reluctant to start a series, even one that's highly acclaimed, because of the commitment it imposes. I read the first Harry Potter before I knew there was or would be a second Harry Potter. I made it through all three books of the Hunger Games trilogy, but only the first of the Twilight series. I never started the Fifty Shades of Grey. 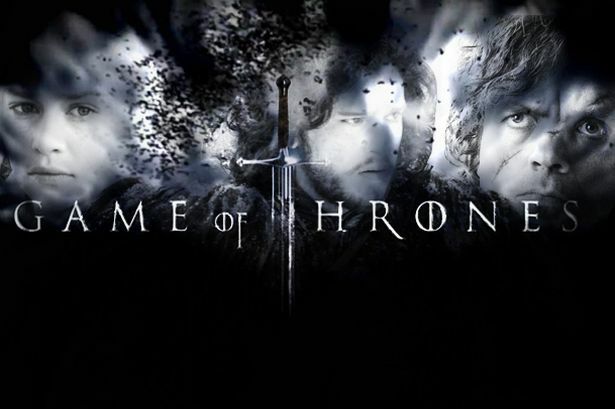 My introduction to Game of Thrones, however, came from my younger son, who'd first discovered the HBO series and gave me a copy of the first book of William R. R. Martin's series for some occasion more than a year ago. I started it then while on a road trip, but I was unable to devote the concentration and attention to remember all the characters and keep them straight. But he kept asking me about it. Some of my students who were avid readers kept asking if I'd read them. When I found the audiobook in at the library, I decided to try again--a 28-CD set. Daunting. This time, though, even though I was listening instead of reading, I managed to separate the threads of the story, to figure out the relationships between all the families involved in this make-believe world. Halfway through, though, I was taking a long drive with my husband, and I knew he wouldn't be interested in listening with me to the second half of a book he hadn't begun reading, so I pulled the paperback off the shelf and took it along. As much as I read and as many audiobooks as I consume, I rarely engage in this hybrid form. It confirmed what I've suspected all along: it makes little difference how I engage with a book. Reading or listening works for me. When I take that little online test "The Brain," my audio and visual preference dot usually winds up dead center. Aside from having to shift from hearing the names to seeing their spelling, I made the transfer easily. Since I'd devoted a good chunk of my free-reading summer to the book, I was eager to finish it--finally. To my chagrin, I realize now that I am ready for Book Two. 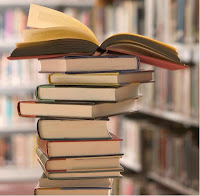 How I feel about books may be metaphorical for how I feel about my life: I'll never have enough time to get to all the books I want to read, but they just keep writing more. Between the Carolina Living section of the Charlotte Observer with the "Summer Reading Guide" (taken from somewhere else, as is usual these days) and the NYT's Sunday "Book Review," my list just keeps growing. 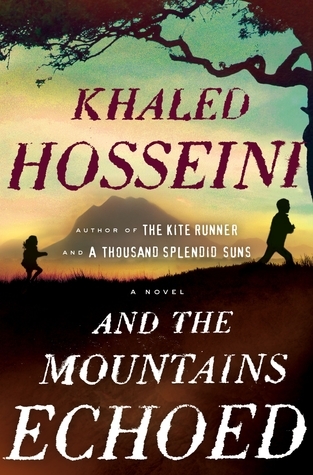 Without question, I need to read Khaled Hosseini's new novel And the Mountains Echoed. I loved his first two, so I can't wait to read this one. I see too that Neil Gaiman has a new novel, his first adult book in awhile, The Ocean at the End of the Lane. Personally, I love his YA books. Colum McCann, who wrote Let the Great World Spin, another favorite from a couple of years back, has just published Transatlantic. 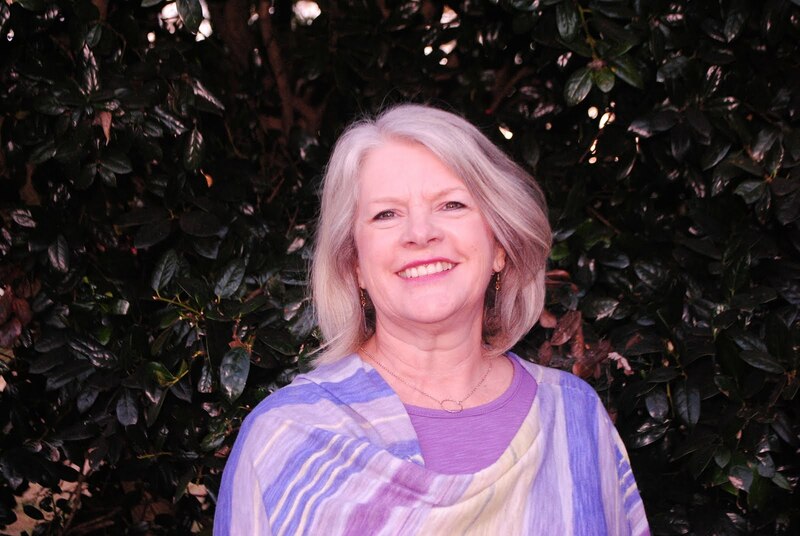 After her two wonderful memoirs, Jeanette Walls has written a novel, The Silver Star. I enjoyed a recent article about her that dealt quite a bit with her relationship with her mother. She is proof, in my opinion, that someone can survive a dysfunctional family and become an amazing adult. On sale tomorrow is The Astronaut Wives Club, a true story. My favorite line in the movie The Right Stuff, based on the Tom Wolfe novel is when one of the wives (Mrs. Grissom, maybe), disappointed and angry that she doesn't get to meet the first lady, calls her husband a "squirming hatch-blower." For now, I'm working my way through Kent Haruff's Eventide and listening to Game of Thrones on audio (although I don't know if I can afford enough gas to drive long enough for the whole book, much less the series.) On the iPad (for reading while I work out) is The Light Between Oceans by M. L. Stedman. I'm reasonably sure that I won't succeed in reading everything I wish to read this summer (any more than I will master all the projects and challenges I'm tackling in the rest of my life), but it's still early June. I might surprise myself. Sometimes I read things out of order. 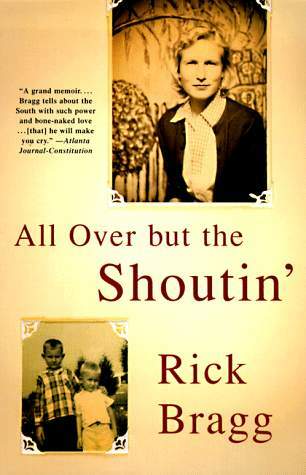 For some reason, I read Rick Bragg's memoir about his grandfather Ava's Man years before I finally got around to reading All Over but the Shoutin'. I loved that book, not only its Alabama setting (the northeast, not the northwest--my own neck of the woods) but the natural, poetic way he wrote about this man he loved and respected. As he repeats more than once in his earlier book, he doesn't give his subjects dignity; he just recognized the dignity that was already there. I finally managed to pull my copy of All Over by the Shoutin' off my shelf this week, resisting the urge to choose an eBook instead for a little road trip. I am so glad I did. The book gives an up-close look at Bragg, from his childhood through his early career success (including his Pulitzer Prize), but he would be the first to tell anyone the book is really about his mother. To be honest, it's almost a love letter to his mother, a good country woman who survived tough times, always putting others--especially her sons--before herself. Bragg tells how he took his one strongest talent--storytelling--and built a journalism career that took him to the New York Times and a fellowship to Harvard. He describes reporting on the chaos in Haiti, the Susan Smith murder case, and the Oklahoma City bombing. He admits to avoiding long-term commitments and always fearing his success would disappear. That fear led to his delay of the one promise he made to himself--eventually to buy a house for his mother, who had always lived in houses owned by someone else. Throughout the book, reveals as much about his own writing style as he does about his life. He managed to plop me right down in the middle of Alabama in a time that was all too familiar, even though I was fortunate not to have lived with all the limits he faced. If he comes across as jaded, even bitter at times, he is also honest. While he demonstrates a lifelong suspicion of those he encountered from the other side of the tracks, he also admits to genuine friendship, kindness, and acceptance from unexpected places. For the record, he presented an insider's view of Alabama football. At times, I had to stop and read out loud. Since I'd heard Bragg read at a book event in Nashville a few years ago, I could imagine I was hearing his voice as I read, a distinct advantage. Sometimes, I imagine my own audiobooks. 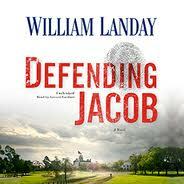 William Landay's novel Defending Jacob edges into Jodi Piccoult's territory: He places the characters in the middle of dilemma, lets them work their way through, and then throws a curve. The story is told by Andy Barber, leading district attorney in a town just outside of Boston, who is investigating the stabbing death of a fourteen-year-old boy on his way to school--until Barber's own son, one of the victim's classmates--is charged with the murder. Placed on the opposite side of the court system, Barber and his wife Laurie not only must convince the court of Jacob's innocence, but their own as well. Andy must admit to his wife Laurie that he has kept secret his own family's past, bringing up the nature-versus-nurture debate. The defense lawyer has the family meet with a counselor who explores new DNA evidence of a potential "murder gene" and diagnoses Jacob as having more than ordinary adolescent angst and social awkwardness. The charge against Jacob affects his parents' marriage, the family's relationship with their neighbors and friends, who distance themselves after the accusations are made public. Readers will realize that whether guilty or innocent, anyone charged with such a heinous, public crime will be changed forever--as will the family. In order to avoid spoilers, I can only say that Landay continued to throw curve balls through the tale, a real narrative rollercoaster ride. I suspect I will be thinking about the story and its conclusion for a long time. Since I teach literature, I tend to read short stories one at a time, rarely reading a whole collection by the same author at one time, which is a shame. Recently, I read Junot Diaz's recent collection This Is How You Lose Her and George Saunders' Tenth of December. I had read Diaz before; in fact, I think my book club may have read his nove The Brief Wondrous Life of Oscar Wao. I've even heard rumors that he may be part of a writers series here in my part of the world next (school) year. The short stories were separate, stand-alone stories, but with some overlap, some characters, particularly Yunior, reappearing in later stories, and all were set in and around New Jersey. The main characters are Dominican immigrants, and Diaz's language is steeped in the flavor his his culture. His characters, often flawed, deal not simply with the immigrant experience, but with the human experience, particularly the loss of love. 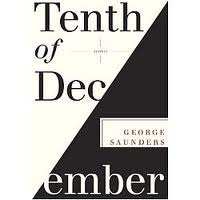 Tenth of December, Saunder's collection, is more loosely connected. Some of the stories are set in the real world, while others are certain imbued by fantasy, sometimes little enough that those elements sneak up on readers. The opening story "Victory Lap" brought to my mind Joyce Carol Oates' "Where Are Your Going? Where Have You Been?" without being the least bit derivative. The title story, which closes the collection, follows two lives that coincide, a dying man attempting to end his life and a young misfit of a boy, out walking and wishing to be a hero, who nearly loses his own life trying to save the man. Between these two, all the characters seem to wrestle with their idea of living with "moral courage," an elusive trait indeed. I realize that one of things I like best about reading a collection of short stories is the quick payoff. I can finish a single story in a short time (I think Poe prescribed one sitting), but then if I want more, there they are. I can also postpone the agonizing decision of what to read next. For now, that decision is pressing. I have two novels I can't wait to read, but while I'm in short story mode, it's time for Ron Rash's Nothing Gold Can Stay. Labels: short stories; Junot Diaz; reading; George Saunders; Ron Rash.